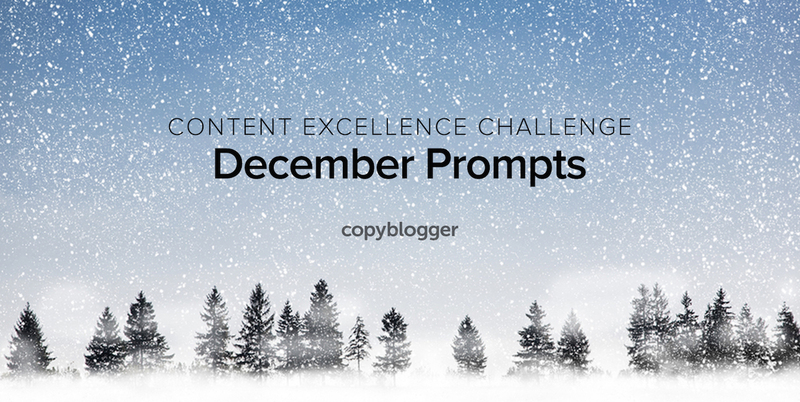 Late last year, I had the wild-hair idea to create a year of prompts that I called the Content Excellence Challenge. We’ve had a year of these creativity and productivity challenges here on Copyblogger, and I think we’ve all arrived at a very special place. Spiritually, ecumenically, grammatically. The community has spent a year trying new creative directions and improving our productive habits. Now we come to the twelfth month, and it’s time for our final pair of prompts. Are you with us? Since this month tends to be a little chaotic anyway, take advantage of the disruptions in your routine to think about what you want to make happen in 2018. What new medium do you want to try? What would you like to do differently? What writing techniques or formats would you like to master? The long winter nights (at least in my hemisphere) are good for dreaming. Instead of waiting for the January resolution rush, start now. What do you want your creative work to look like in the coming year? Now, taking a look at your goals, wishes, and creative dreams … what has to change in your habits to get you there? If your first answer is, “I have to write for two hours consistently every single day,” and currently you don’t write at all most days, that’s a good indicator it’s a long-term habit goal. Let’s start with something a lot smaller. Decide now to quit making grand plans that never get implemented. Instead, commit to something so small you know you can easily do it every day. Even on sick days. Even when your in-laws are in town. Here’s a proven four-part plan that can make that happen for you. For many of us, this is the ingestion of the first caffeinated beverage of the day. You could certainly choose a different trigger — just make sure it’s something that happens every day. Then, make a commitment to one habitual behavior that’s very easy. If 10 minutes feels too hard right now, you can bump it down to something that feels better. If it feels way too easy … that’s okay. Leave it at 10 minutes. You’re always very welcome to go longer if you feel like it, and most days you probably will. Some days are going to be ridiculous. You can make a decision right now that you’ll take certain days off — for example, the holidays. You’ll also want to come up with a plan for the days that are just garden-variety crazy. Life is not smooth, simple, or cooperative. So make a plan for how you’re going to address that inevitable reality. You could use this one if it happens to fit you, or adjust it as you see fit. And if you want to rework it down the line, you absolutely can. The only “rule” is not to push that daily mini commitment to anything that isn’t insanely easy. It has to be something you can commit to with complete confidence. I guarantee that you will miss some days, particularly early on. When you do, don’t try to write for 20 minutes the next day, or an hour over the weekend. Just take that iPad into the bathroom the next time you can and get today’s writing done. And then continue on your normal track. If you have some time off this month (or a little too much time with relatives that you’d like to fill up with some work), you’re always welcome to go back to the earlier prompts and find some more things to work on. Doing this month’s challenge? Let us know in the comments! Thank you, love this! As a content strategist, I have produce (and find) a lot of high-quality content. I’ve made goals to write three blog posts a week while keeping up with social media posts, engagement, and interaction. We are trying to increase our following and page ranking. Hoping the goals aren’t too lofty. Looking forward to more insightful posts. 3 a week is a lot! But if you have the right processes in place, it’s doable. It’s good if you have some consistent “go-to” content types that you know you can produce efficiently. We must take tiny steps to success – if bigger steps are not working well! This is something that I do with big goals. I know it can be very hard to accomplish high levels of success with an online business. It takes a lot of time and effort. And most people don’t even make it. I think it is because most try to take huge steps forward and are not patient enough, and that is why they fail short – every time. But when you take very little steps forward, daily, you accomplish more and don’t burn yourself out. I like setting micro-goals for my day. This is how I have been able to be more productive and build a strong self-discipline to do what I need to do. I like the idea of small steps. It’s a bit like the Agile methodology – break tasks down as small as possible, and then deliver on them! This post actually inspires me to take action :). Commiting is easy, but taking action every day is hard. Chopping writing goal into tiny steps is a great idea!